In an experiment with a B2B company, we split tested two landing pages against each other. Let me give you a brief background on the test, and then, I invite you to guess which landing page produced the most leads. 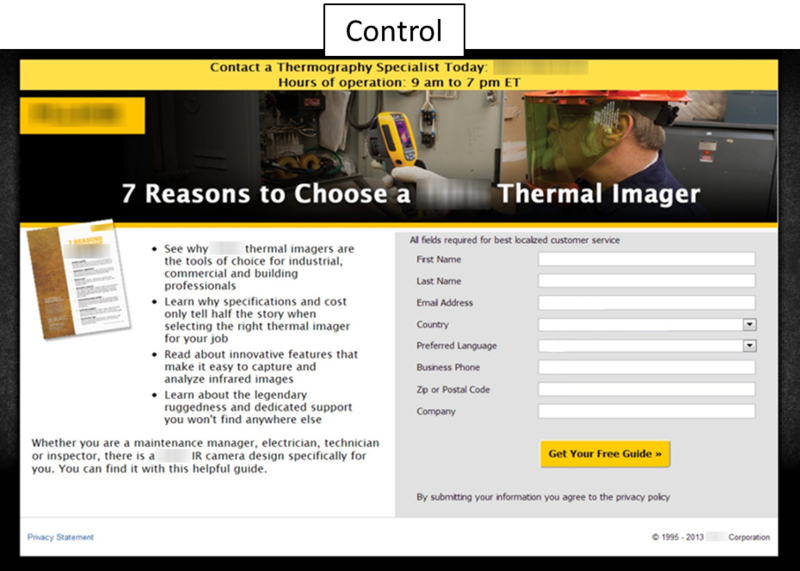 This B2B company wanted to promote one of its thermal imaging cameras by creating a downloadable guide where people can enter personal information on a landing page registration form and then get access to a product guide download that will help them choose which thermal imaging camera to purchase. Which landing page do you think generated the most leads in this experiment? Which landing page do you think won? The control had a clickthrough rate of 2.7%. Treatment 1 was created after dissecting the potential motivation of the current customers. It had a clickthrough rate of 6.0%, almost 96% more leads than the original design. How would an increase of 96% in your marketing campaigns impact your company? How would this increase affect your role? There are many elements that changed between the control and the treatment, including: reduced friction, reduced anxiety, a more carefully chosen image and customer centric vs. company centric. Let’s take a closer look how all of those elements helped tip the balance to value over force. Your responsibility as a marketer is to tip the scale to get to more “yes(s)” from your ideal prospect. How can we tip this scale toward greater value? We can reduce costs, right? That is what a lot of companies do. They slash their prices to get to more prospects to say “yes.” These companies may boast about their new increase in conversions, but slashing prices may not always be what is best for the company, especially if it eliminates any revenue potential. Another way to tip the scale to get more “yes(s)” is to increase the Value Force of the product or service presented. If the marketer can present the product or service in a more appealing way, they may be able to attract more prospects. For example, one genius advertising executive, Gary Dahl, took a rock he found outside, put the rock in a package and called it a “Pet Rock.” In 1975, Pet Rocks sold for $3.95 a piece and sold over 5 million units in just six months. This marketer tipped the Value scale to a “yes” by leveraging the product’s perceived value. This just goes to show you how valuable tipping the scale in Value’s favor can really be. In next week’s MarketingExperiements Blog post, I will explore this essential scale on a deeper level and share more tactics and ways this idea can help improve your marketing efforts. The treatment on the very first second I look at it seems easier to fill out, but that is my guess. In any cast good one and thanks for sharing. I just realized — An increase from 2.7% to 6% isn’t a 95.8% increase, it’s a 122.2% increase. Thanks for the comments! I went back through the test protocols and Warren is correct. Thank you for bringing this up.